Call for the bandilleros and the picadors. You know, I knew that lady. She used to visit my mother. The furs at her neck bit each other’s tails. because her throat was too small. All my life I have listened for breathing. of a very old dog. Who will listen for breaths when I am gone? Who listened before I was born? Mother, I am hiding under the washtub. Daddy, I am hiding under the lilacs. I have been hiding for fifty years. This is what my new year is saying to me: chase a cow over fresh moons, listen for breathing. I'm indebted to the amazing poet Penelope Scambly Schott for permission to use this poem. Here's a recent profile of Penelope in Combustus. 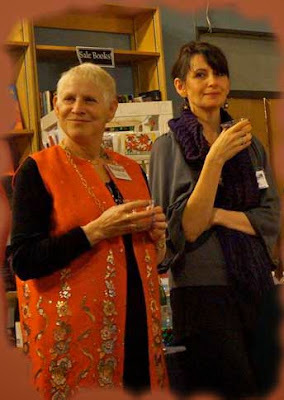 Penelope Scambly Schott, featured poet at a Voicecatcher event.